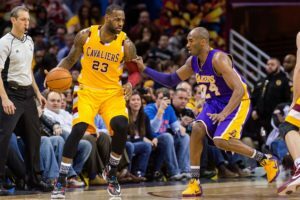 LeBron James #23 of the Cleveland Cavaliers posts up against Kobe Bryant #24 of the Los Angeles Lakers during the first half at Quicken Loans Arena on February 10, 2016 in Cleveland, Ohio. Photo courtesy of the NBA. Meet Davis Paul: The Kid’s On (Chicago) Fire — Check Out Reel Video, Too!